"It is exactly as it is in the picture. Arrived in perfect time and very good communication regards tracking / dispatch. It looks so delicate and yet is sturdy in design. It is stunning and I loved wearing it. Clip was comfy. An absolute joy to wear. Thank you." 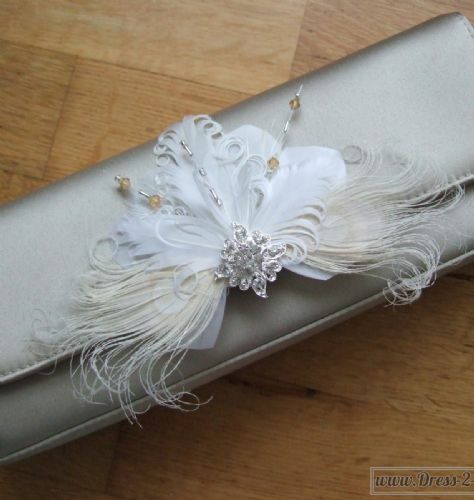 "Great communication on the order and a stunning (and I mean STUNNING) item to wear on my wedding day. I bought the shoe clips too, and together were divine. Thank you so much." Beautiful Hand Made Fascinator called "Lena", made to order in 4 Working Days. Handmade to order in 4 working days. 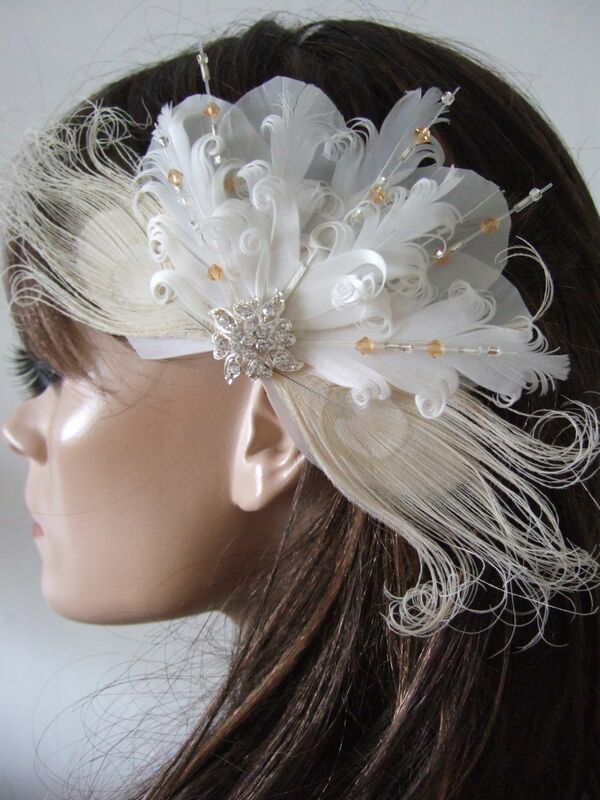 A Beautiful Hand Made Fascinator called "Lena", in Delicate White Curled Goose Nagoire and Bleached Peacock Feathers, in a Fanned Bow arrangement with 5 Rows of Crystals in Gold Swarovski and Silver Glass Beads, finished with a Crystal Brooch. 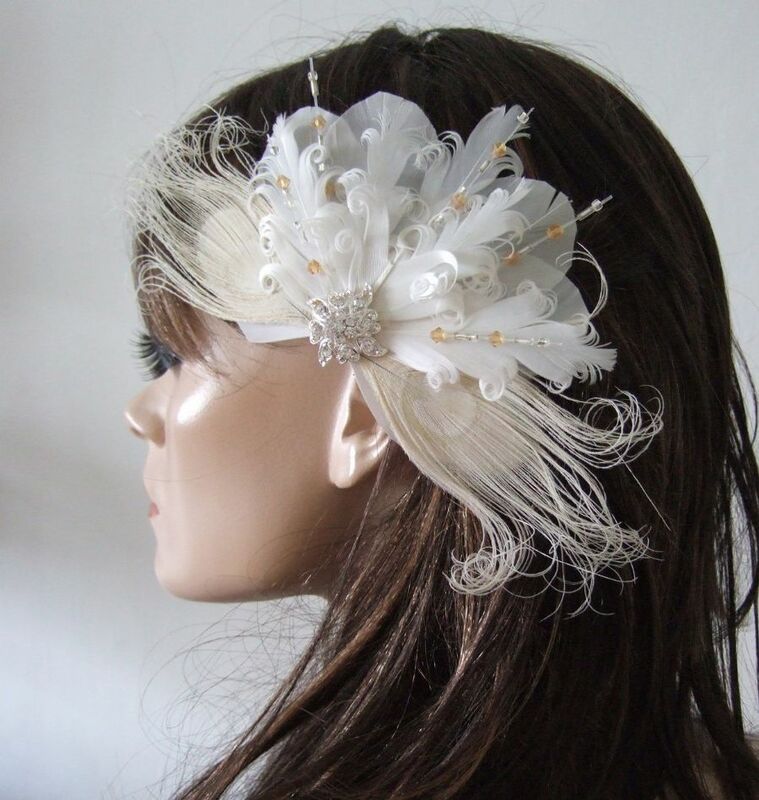 Really Pretty with the Feathers curled and layered giving plenty of 3D and the Crystals arranged on thin clear wires through the layers. 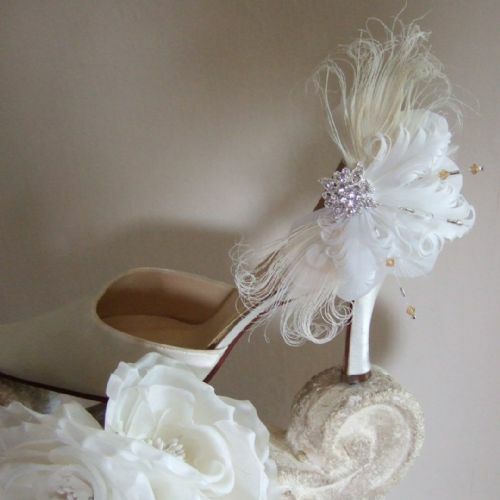 This is a perfect Bridal Wedding Fascinator for a Rustic Theme Wedding, Barn Wedding or Fairytale wedding. 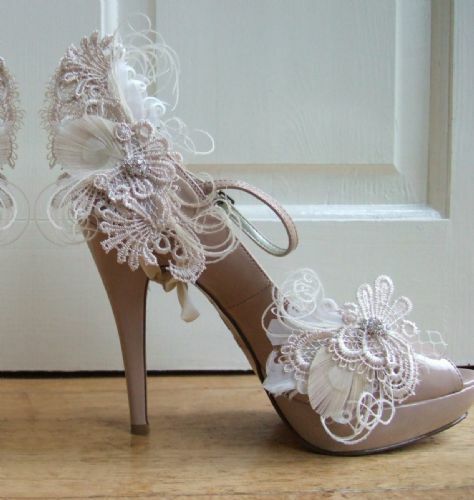 Suitable for Bridesmaids, and the Bride. 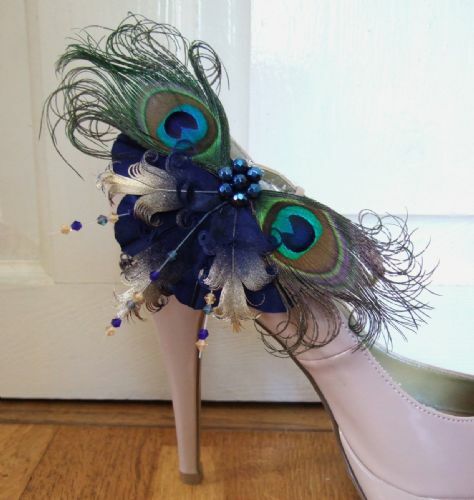 Looks divine when worn with the Matching Shoe Clips also available. The Fascinator is made to order and I try to always use the same brooches that are in the picture, but sometimes (occassionally) the brooch will be slightly different, but always similar, and always the same scale as one in the pictures. Suitable for Bridesmaids, and Brides (or other parties and proms). 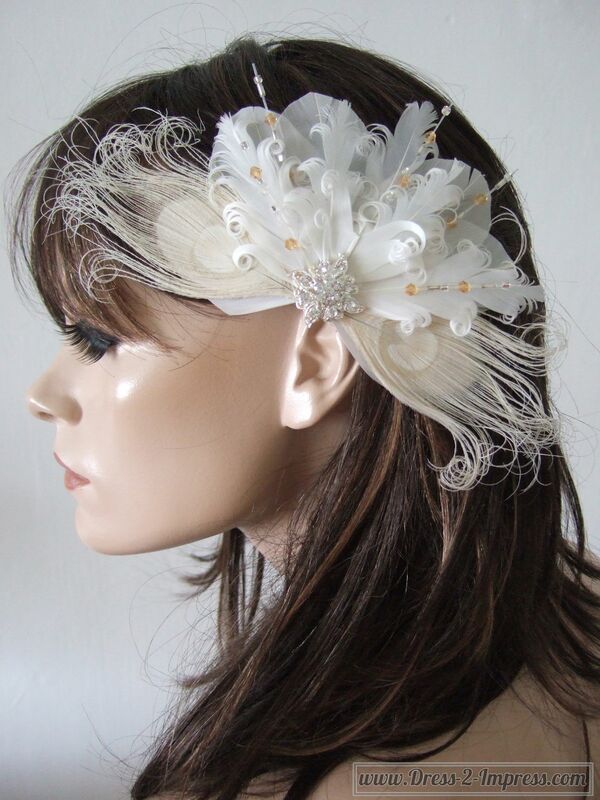 A great bridal accessory for a Rustic Wedding Theme, Edwardian Themed, Vintage Inspired or Gatsby Wedding. 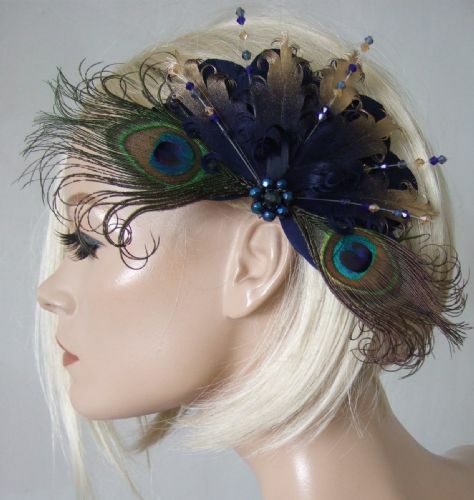 The Clip Measures approx 8" width x 4.25" (including the curly ends of the peacock feathers). 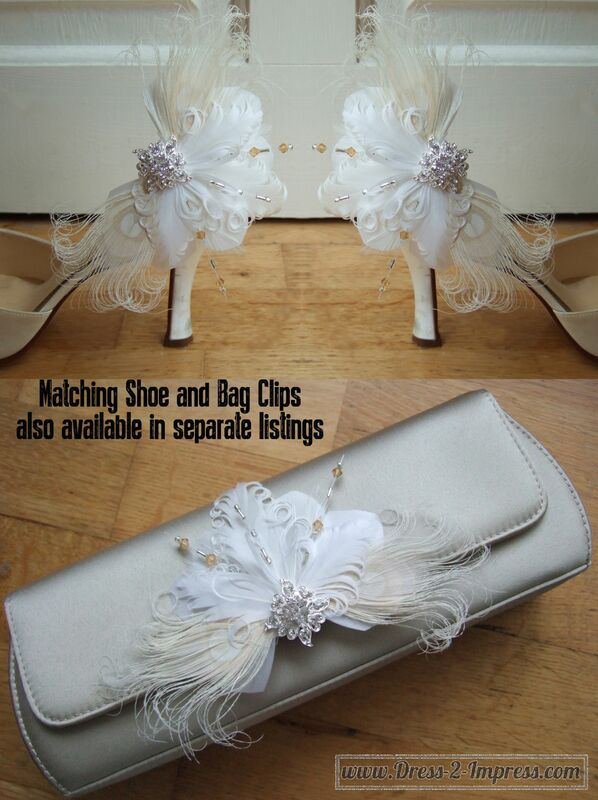 The last picture shows the matching pair of Shoe Clips, and the Bag Clip. Type Lena into the search box and it will show you the links for all the three items. The fascinator attaches by a crocodile clip on the underside. 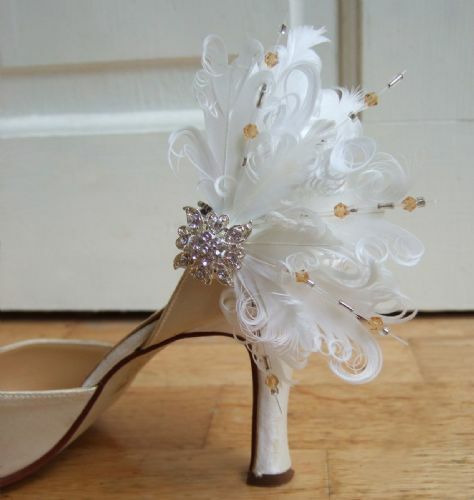 All our Clip designs are backed on millinery SINAMAY and not just felt that others often use. The crocodile clips is also sewn and not just quickly glued on. Using millinery sinamay and sewing, ensures a totally secure solid shape and form, and a clip that will not become unattached. 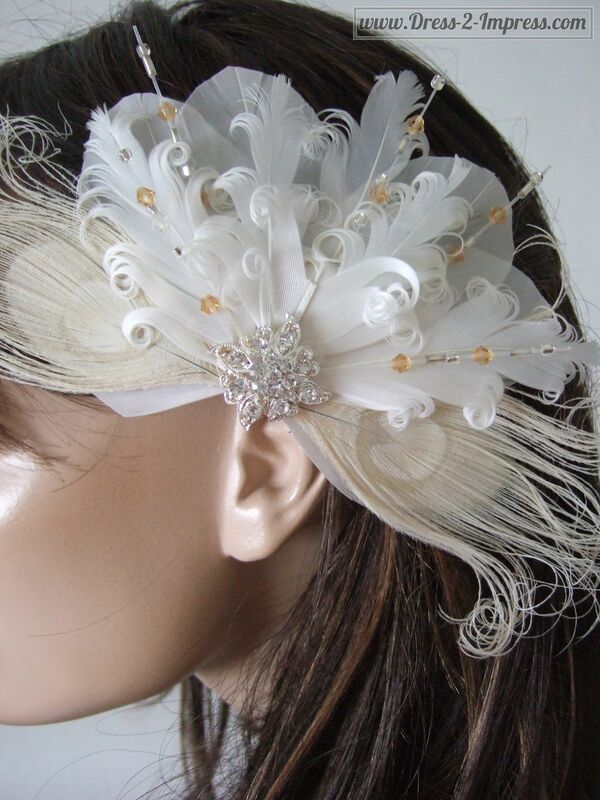 Please be aware that fascinators are made to order, so please allow up to 4 working days before item is dispatched.